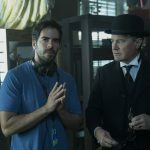 Director Eli Roth with actor Kyle McLachlan on the set of “The House With A Clock in Its Walls,” the spine-tingling, magical adventure of a boy who goes to live with his eccentric uncle in a creaky old house with a mysterious tick-tocking heart. Based on the first volume in the beloved children’s series of books, the film is directed by master frightener Eli Roth. 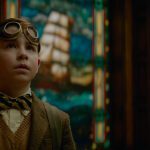 Owen Vaccaro (“Daddy’s Home”) stars as Lewis Barnavelt, a recently orphaned boy sent to live with his eccentric uncle in “The House With A Clock in Its Walls,” the spine-tingling, magical adventure of a boy who goes to live with his eccentric uncle in a creaky old house with a mysterious tick-tocking heart. Based on the first volume in the beloved children’s series of books, the film is directed by master frightener Eli Roth. 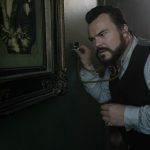 Uncle Jonathan (Jack Black) is a warlock searching for the location of nefarious ticking sound in his home in “The House With A Clock in Its Walls,” the spine-tingling, magical adventure of a boy who goes to live with his eccentric uncle in a creaky old house with a mysterious tick-tocking heart. Based on the first volume in the beloved children’s series of books, the film is directed by master frightener Eli Roth. 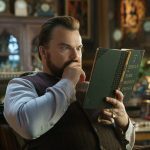 Uncle Jonathan (Jack Black) with a collection of objects that aren’t quite what they seem in “The House With A Clock in Its Walls,” the spine-tingling, magical adventure of a boy who goes to live with his eccentric uncle in a creaky old house with a mysterious tick-tocking heart. Based on the first volume in the beloved children’s series of books, the film is directed by master frightener Eli Roth. 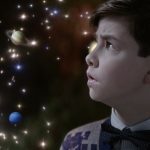 Lewis Barnavelt (Owen Vaccaro) sees the home of his Uncle Jonathan (Jack Black) for the first time in “The House With A Clock in Its Walls,” the spine-tingling, magical adventure of a boy who goes to live with his eccentric uncle in a creaky old house with a mysterious tick-tocking heart. Based on the first volume in the beloved children’s series of books, the film is directed by master frightener Eli Roth. Director Eli Roth, Jack Black and Cate Blanchett on the set of “The House With A Clock in Its Walls,” the spine-tingling, magical adventure of a boy who goes to live with his eccentric uncle in a creaky old house with a mysterious tick-tocking heart. Based on the first volume in the beloved children’s series of books, the film is directed by master frightener Eli Roth. 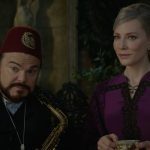 Mrs. Zimmerman (Cate Blanchett) and Uncle Jonathan (Jack Black) on their street in New Zebedee in “The House With A Clock in Its Walls,” the spine-tingling, magical adventure of a boy who goes to live with his eccentric uncle in a creaky old house with a mysterious tick-tocking heart. Based on the first volume in the beloved children’s series of books, the film is directed by master frightener Eli Roth. 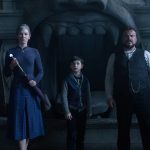 Uncle Jonathan (Jack Black), Mrs. Zimmerman (Cate Blanchett) and Lewis Barnavelt (Owen Vaccaro) face down some dark magic in “The House With A Clock in Its Walls,” the spine-tingling, magical adventure of a boy who goes to live with his eccentric uncle in a creaky old house with a mysterious tick-tocking heart. Based on the first volume in the beloved children’s series of books, the film is directed by master frightener Eli Roth. 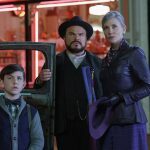 Owen Vaccaro (Lewis Barnavelt), Jack Black (Uncle Jonathan) and Cate Blanchett (Mrs. Zimmerman) in “The House With A Clock in Its Walls,” the spine-tingling, magical adventure of a boy who goes to live with his eccentric uncle in a creaky old house with a mysterious tick-tocking heart. Based on the first volume in the beloved children’s series of books, the film is directed by master frightener Eli Roth. Cate Blanchett plays Mrs. Zimmerman, a brilliant witch with a tragic past, in “The House With A Clock in Its Walls,” the spine-tingling, magical adventure of a boy who goes to live with his eccentric uncle in a creaky old house with a mysterious tick-tocking heart. Based on the first volume in the beloved children’s series of books, the film is directed by master frightener Eli Roth. 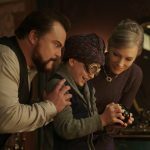 Uncle Jonathan (Jack Black, left) and Mrs. Zimmerman (Cate Blanchett, right) wait to see if Jonathan’s nephew Lewis (Owen Vaccaro) can solve a mystery with a Magic 8 ball in “The House With A Clock in Its Walls,” the spine-tingling, magical adventure of a boy who goes to live with his eccentric uncle in a creaky old house with a mysterious tick-tocking heart. Based on the first volume in the beloved children’s series of books, the film is directed by master frightener Eli Roth. 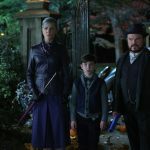 Mrs. Zimmerman (Cate Blanchett), Lewis Barnavelt (Owen Vaccaro), and Uncle Jonathan (Jack Black) face down some dark magic in “The House With A Clock in Its Walls,” the spine-tingling, magical adventure of a boy who goes to live with his eccentric uncle in a creaky old house with a mysterious tick-tocking heart. Based on the first volume in the beloved children’s series of books, the film is directed by master frightener Eli Roth. 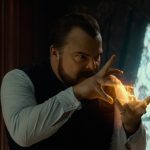 Jack Black plays Uncle Jonathan, a warlock desperate to prevent the return of a dark force, in “The House With A Clock in Its Walls,” the spine-tingling, magical adventure of a boy who goes to live with his eccentric uncle in a creaky old house with a mysterious tick-tocking heart. Based on the first volume in the beloved children’s series of books, the film is directed by master frightener Eli Roth. 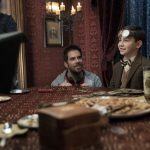 Director Eli Roth with young star Owen Vaccaro on the set of “The House With A Clock in Its Walls,” the spine-tingling, magical adventure of a boy who goes to live with his eccentric uncle in a creaky old house with a mysterious tick-tocking heart. Based on the first volume in the beloved children’s series of books, the film is directed by master frightener Eli Roth. 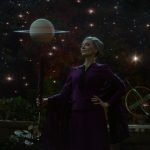 Mrs. Zimmerman (Cate Blanchett) trades witty insults with her friend Uncle Jonathan (Jack Black) in “The House With A Clock in Its Walls,” the spine-tingling, magical adventure of a boy who goes to live with his eccentric uncle in a creaky old house with a mysterious tick-tocking heart. Based on the first volume in the beloved children’s series of books, the film is directed by master frightener Eli Roth. 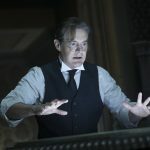 Kyle McLachlan plays Isaac Izard, a wizard seduced by dark magic, in “The House With A Clock in Its Walls,” the spine-tingling, magical adventure of a boy who goes to live with his eccentric uncle in a creaky old house with a mysterious tick-tocking heart. Based on the first volume in the beloved children’s series of books, the film is directed by master frightener Eli Roth. 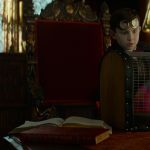 Rose Rita Pottinger (Vanessa Anne Williams) tries to befriend new kid Lewis Barnavelt (Owen Vaccaro) in “The House With A Clock in Its Walls,” the spine-tingling, magical adventure of a boy who goes to live with his eccentric uncle in a creaky old house with a mysterious tick-tocking heart. Based on the first volume in the beloved children’s series of books, the film is directed by master frightener Eli Roth. 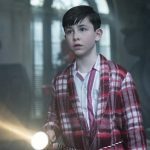 Owen Vaccaro (“Daddys Home”) stars as Lewis Barnavelt, a recently orphaned boy sent to live with his eccentric uncle in “The House With A Clock in Its Walls,” the spine-tingling, magical adventure of a boy who goes to live with his eccentric uncle in a creaky old house with a mysterious tick-tocking heart. Based on the first volume in the beloved children’s series of books, the film is directed by master frightener Eli Roth. 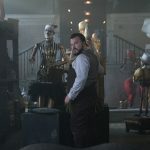 The objects in the mansion of Uncle Jonathan (Jack Black) arent always inanimate in “The House With A Clock in Its Walls,” the spine-tingling, magical adventure of a boy who goes to live with his eccentric uncle in a creaky old house with a mysterious tick-tocking heart. Based on the first volume in the beloved children’s series of books, the film is directed by master frightener Eli Roth. 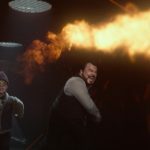 Jack Black (Uncle Jonathan) and Owen Vaccaro (Lewis Barnavelt) in “The House With A Clock in Its Walls,” the spine-tingling, magical adventure of a boy who goes to live with his eccentric uncle in a creaky old house with a mysterious tick-tocking heart. Based on the first volume in the beloved children’s series of books, the film is directed by master frightener Eli Roth. 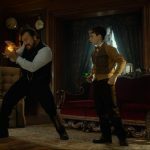 Owen Vaccaro (Lewis Barnavelt) and Jack Black (Uncle Jonathan) in “The House With A Clock in Its Walls,” the spine-tingling, magical adventure of a boy who goes to live with his eccentric uncle in a creaky old house with a mysterious tick-tocking heart. Based on the first volume in the beloved children’s series of books, the film is directed by master frightener Eli Roth.